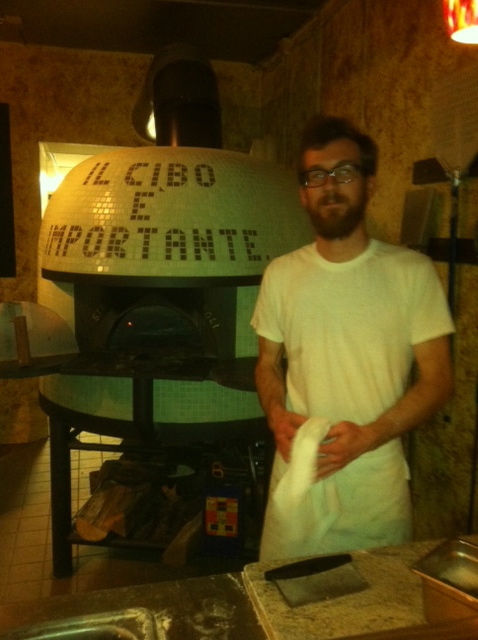 Il cibo e importante…food is important, are the words tiled on the hand built stone and brick oven at the Lincoln Wine Bar in Mount Vernon, IA. Stefano Ferrara would be proud of his oven exported from Naples, Italy to this unique cafe in a town populated with just over 4,000 people. When we arrived at the Lincoln Cafe, our table was not quite ready, so we were directed to walk several buildings away to the Lincoln Wine bar. It was there that the beautiful oven cooks with primarily elm, oak and fruit wood on an oven floor temp of 700-900 degrees. It only takes about 90-120 seconds to cook a neapolitan pizza – a must with your bottle of wine, that must be toted back down to the Cafe when your table is called. The liquor license laws require two restrooms and the cafe only has one so its Bring-your-own-wine from the up the street. If you need another bottle, just head up the street for another bottle from the Wine Bar with oven. The entire experience was quirky and lovely. This entry was posted in simple living tips JJ Palmtag and tagged food, mount vernon ia, restaurants. Bookmark the permalink.